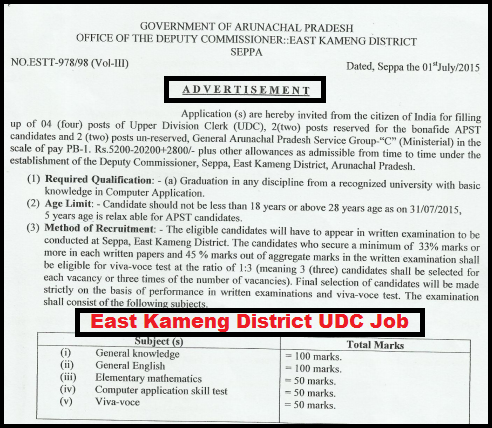 Office of the Deputy Commissioner, East Kameng District, Seppa, Government of Arunachal Pradesh, invites application in prescribed format for recruitment to the post of ‘Upper Division Clerk-UDC -04 (02 posts reserved for the bonafied APST candidates and 02 posts un-reserved )’ on permanent basis in general Arunachal Pradesh Service Group ‘C’ (Ministerial) in the pay scale of (Pay Band-I) Rs, 5200-20200 with grade pay Rs.2800 plus other allowances as admissible from time to time under the establishment of the Deputy Commisioner, Seppa, East Kameng District, Arunachal Pradesh-AP. The date of written test and viva-voce will be intimated on 31st July 2015 at 1600 hrs at the notice board of the Office of the Deputy Commissioner. 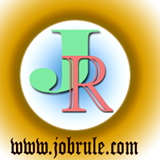 The interested candidates may download the advertisement/ Written test admit card/call letter from official website.